Fire destroyed a Cross Lake camp early Monday afternoon but firefighters were able to extinguish flames that spread to nearby trees. 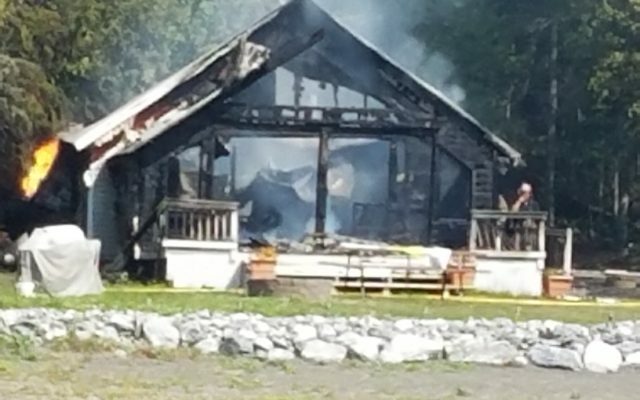 CROSS LAKE, Maine — Fire destroyed a Cross Lake camp early Monday afternoon but firefighters were able to extinguish flames that spread to nearby trees. North Lakes Fire and Rescue Chief Darren Woods said 15 volunteer firefighters responded along with four fire trucks after a caller reported the fire at 11:15 a.m. at 29 Sylvio Road. “Somebody out on the lake actually saw it,” Woods said. The camp already was engulfed in flames when firefighters arrived and the fire had spread into the trees, “but the guys quickly put the woods fire out and contained the fire to the structure,” the chief reported. Members of the St. Agatha Fire Department assisted in battling the blaze. The cause of the fire has yet to be determined, Woods said. The owners of the camp, a St. John couple, were not at the camp when the fire occurred and nobody was injured, according to Woods. The camp was insured, he said. Firefighters cleared the scene just after 4 p.m.